With his passport confiscated by the Russian Government and owing creditors in both Russia and Germany RICHARD WAGNER with his wife MINNA head for the Russian Border in an attempt to reach France to have his first opera produced. The plan is to escape from Russia to Germany where he is also a wanted man and secretly board a ship bound for England then cross the channel to France where he hopes to have his traditional opera Rienzi produced. Shortly thereafter a major breakthrough occurs as his second opera influenced by his daring escape by sea, Flying Dutchman is a great success in Germany and Wagner becomes famous. Getting involved in a revolution to overthrow the Monarchy was Wagner's big downfall. He barely escapes capture for treason and moves to Switzerland in exile. 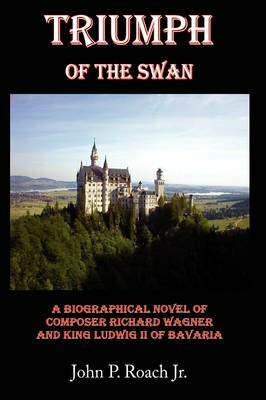 While in exile in Zurich, Wagner writes an opera about the German Teutonic hero LOHENGRIN, who arrives with a SWAN towing his boat to save a woman accused of witchcraft. . Prince LUDWIG of Bavaria at age 15 is fascinated by the swan in the Lohengrin Opera. He asks his governess for the libretti of Wagner's Operas. Years go by in exile and Wagner becomes completely destitute with creditors again chasing him. He longs for his homeland Germany, his love life is in shambles and he lives in hiding. King Max of Bavaria dies and his now19 year old son Crown Prince Ludwig II becomes King of Bavaria. Within 14 days, he summons Richard Wagner to the Palace. King Ludwig II befriends Richard Wagner and lets him know he will never have to worry about money again. He encourages Richard to work on The Ring Cycle, a four Opera drama to be performed in a Theatre built to Wagner's own specifications. Authors: John P. Roach Jr.